This item ships FOB Wisconsin and requires a custom shipping charge. At checkout, your card will be charged for the item only without shipping. We will contact you prior to shipping to arrange delivery and payment for shipping. If you would like a quote on shipping before purchase, please email us or call us at 1-800-243-4466 (Monday-Friday, 9am to 5pm EST). 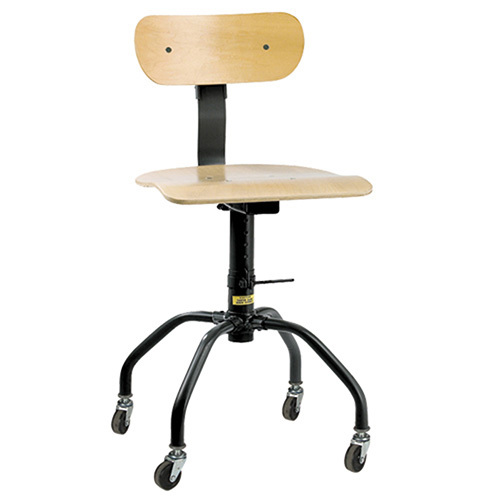 An economical but extremely sturdy swivel bench chair. Reduces fatigue and increases productivity by providing comfortable contoured support. Hardwood seat and spring back are independently adjustable. Seat adjusts from 18-1/2" to 26-1/2". Heavy-duty casters are included for smooth movement. Casters can easily be removed if desired.